At least five climbers and high-altitude Sherpa guides have lost their lives in the world's highest peak Mount Qomolangma this spring season, authorities confirmed. 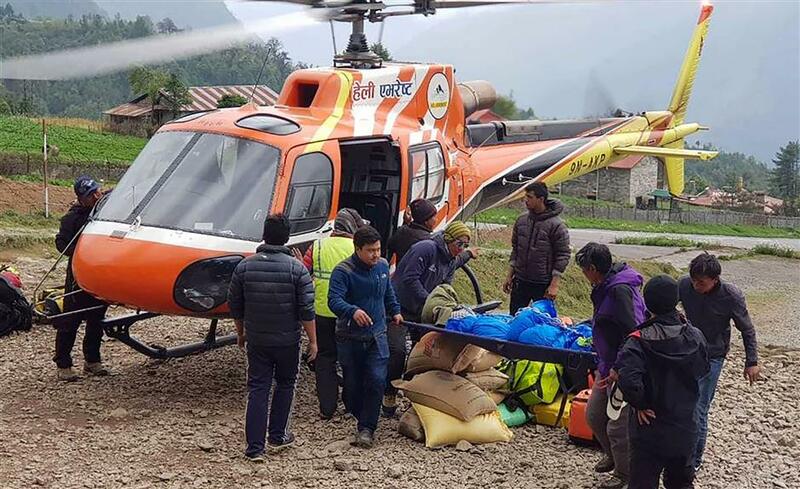 Nepali men carry the body of Japanese climber Nobukazu Kuriki onto a helicopter after it was recovered from Mount Qomolangma, at a helipad in Lukla to be airlifted to Kathmandu on May 21, 2018. With the onset of expedition after eight rope-fixing team opened the climbing route on May 13 this year, two foreign climbers and three Sherpa guides have lost their lives. "This week, the Japanese climber Nobukazu Kuriki died in Camp II while the Macedonian climber Gjeorgi Petkov lost his life above Camp III," Gyanendra Shrestha, an official at the Department of Tourism under the Ministry of Culture, Tourism and Civil Aviation, told Xinhua via telephone from the base camp. Besides, at least three Sherpa guides, who are regarded as the backbone of Qomolangma expeditions, have lost their lives in the mountain, according to base camp officials. According to Nepal's tourism department, the official government body which issues climbing permits for the Qomolangma expedition, 346 mountaineers from Nepali and foreign teams have taken the permits this year. Summit bids are expected to take place till the end of May, which is the most suitable period for expedition owing to favorable weather. Qomolangma has not only been an identity of this Himalayan country but also a major source of revenue. According to the Nepali regulation, every foreigner needs to pay 11,000 U.S. dollars as royalty while a Nepali climber has to pay 75,000 rupees (710 U.S. dollars) to scale the mountain. Nepal's high hopes on Qomolangma revived since 2016 after the expedition was halted for two consecutive years in 2014 and 2015 due to a massive avalanche and a 7.8-magnitude earthquake respectively.